SAN FRANCISCO — The United States should create a new agency dedicated to manned exploration of the moon, Mars and other destinations in deep space, a former Apollo astronaut says. 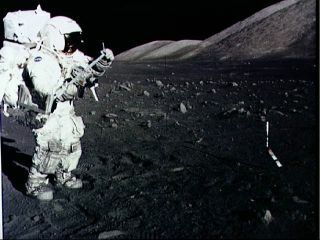 Human exploration of such far-flung locales is a challenging proposition, so it would benefit from the type of laser-like attention that NASA gave its Apollo moon program back in the 1960s and early '70s, said Harrison Schmitt, who walked on the lunar surface on the Apollo 17 mission in 1972. "You need to have an agency that is focused on that, and almost nothing else," Schmitt said here today (Dec. 6) at the annual fall meeting of the American Geophysical Union. He recommends that the government "create a new agency that can indeed learn the lessons of Apollo and apply them." Schmitt, who later served as a one-term U.S. senator, suggests the new agency be called the National Space Exploration Administration. He first put forward the idea in an online proposal published in May 2011. The new deep-space agency should "stay young, and develop a management structure that is not so hierarchical — that is actually a flat, level management structure so young ideas can reach the top very quickly," added Schmitt, who was the 12th and final person to set foot on the moon, and the only trained geologist to do so. "That happened in Apollo." Schmitt was speaking on the eve of the 40th anniversary of his Apollo 17 launch, which blasted off Dec. 7, 1972. Since that mission, no human has been back to the moon. Schmitt thinks a new deep-space exploration agency should have an open portfolio and consider a wide variety of destinations. But he believes strongly that the moon is the first body astronauts should target beyond low-Earth orbit. "My feeling is, by going back to the moon, you accelerate your ability to go anywhere else — both in terms of experience and in terms of resources, and testing new hardware and navigation techniques, communication techniques and things like that," Schmitt said. "And it's only three days away." Schmitt stressed that his recommendation is not meant as a rebuke of any kind to NASA, which he said "is doing an absolutely remarkable job with the missions it's been allowed to proceed with." NASA had been working toward sending astronauts to the moon by 2020, under a program called Constellation that was initiated during the George W. Bush administration. In 2010, President Barack Obama cancelled Constellation after an independent review panel found it to be significantly behind schedule and over budget. Obama instead directed NASA to get humans to a near-Earth asteroid by 2025, then on to the vicinity of Mars by the mid-2030s. The agency is currently developing a huge rocket called the Space Launch System and a crew capsule called Orion to make all of this happen.